apple didn't invent the touchscreen. Apple didn't even reinvent it (Apple probably acquired its much hyped multitouch technology when it snapped up a company called Fingerworks in 2005). But Apple knew what to do with it. Apple's engineers used the touchscreen to innovate past the graphical user interface (which Apple helped pioneer with the Macintosh in the 1980s) to create a whole new kind of interface, a tactile one that gives users the illusion of actually physically manipulating data with their handsflipping through album covers, clicking links, stretching and shrinking photographs with their fingers. This is, as engineers say, nontrivial. It's part of a new way of relating to computers. Look at the success of the Nintendo Wii. Look at Microsoft's new Surface Computing division. Look at how Apple has propagated its touchscreen interface to the iPod line with the iPod Touch. Can it be long before we get an iMac Touch? A TouchBook? Touching is the new seeing. jobs didn't write the code inside the iPhone. These days he doesn't dirty his fingers with 1's and 0's, if he ever really did. But he did negotiate the deal with AT&T to carry the iPhone. That's important: one reason so many cell phones are lame is that cell-phone-service providers hobble developers with lame rules about what they can and can't do. 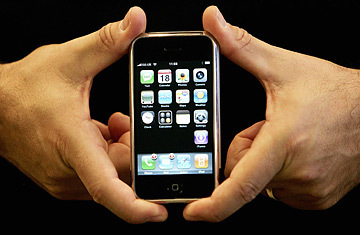 AT&T gave Apple unprecedented freedom to build the iPhone to its own specifications. Now other phone makers are jealous. They're demanding the same freedoms. That means better, more innovative phones for all. when apple made the iphone, it didn't throw together some cheap-o bare-bones firmware. It took OS X, its full-featured desktop operating system, and somehow squished it down to fit inside the iPhone's elegant glass-and-stainless-steel case. That makes the iPhone more than just a gadget. It's a genuine handheld, walk-around computer, the first device that really deserves the name. One of the big trends of 2007 was the idea that computing doesn't belong just in cyberspace, it needs to happen here, in the real world, where actual stuff happens. The iPhone gets applications like Google Maps out onto the street, where we really need them. And this is just the beginning. Platforms are for building on. Last month, after a lot of throat-clearing, Apple decided to open up the iPhone, so that youmeaning people other than Apple employeeswill be able to develop software for it too. Ever notice all that black blank space on the iPhone's desktop? It's about to fill up with lots of tiny, pretty, useful icons.